Halloween Countdown: Chills! Horror! Suspense! Vintage spookshow posters are fantastic (I have a large collection of them in my image files; I wish I could post them all). 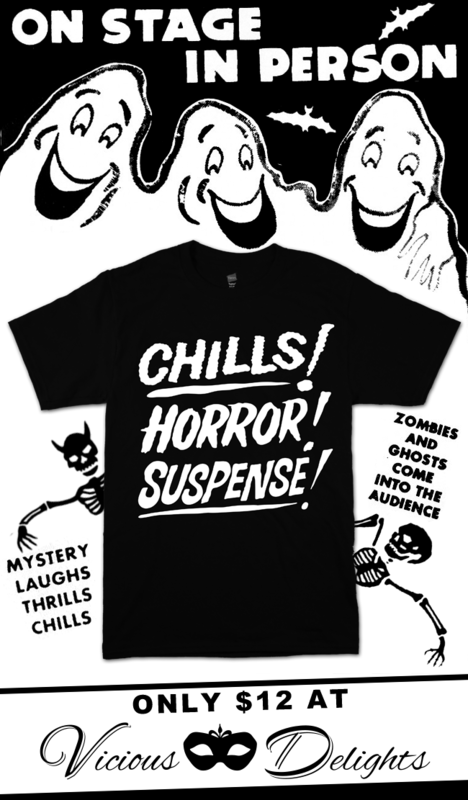 This shirt really appeals to me because it’s not only a throwback to the golden era of spookshows…it gets to the point. The hell with subtlety. Even better? It’s hand screen printed for only $12! Unfortunately, being the elfin creature that I am, an adult “small” T-shirt (the smallest they make) nearly fits me like a dress…perhaps I will have to create my own. This entry was posted on October 23, 2015 at 3:53 pm and is filed under clothing, halloween, horror with tags clothing, halloween, horror. You can follow any responses to this entry through the RSS 2.0 feed. You can leave a response, or trackback from your own site.